Replacing a stock barrel may not be on the top of many Glock owner’s minds, but it’s easy, improves accuracy, and can be affordable. For competitive shooters, the improved accuracy can make a huge difference. Finding the right one can be hard, so let’s examine the best barrels on the market. Then, we’ll demonstrate how to make the swap. 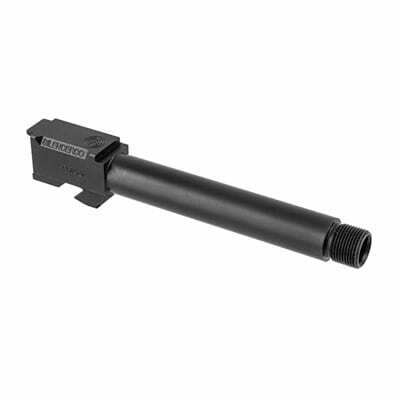 Are All Glock Barrels Interchangeable? Unfortunately, not all Glock barrels are interchangeable. For example, if you want a barrel capable of handling .40 or .357 SIG ammunition on a Glock 17 or a Glock 19, it requires changing the upper receiver. Ideally, gun owners would determine these limitations prior to purchasing a Glock model that won’t suit their needs or desires, but that isn’t always the case. The Glock 29, for example, has some of the most options for barrels and slides, but that doesn’t help if you don’t have one. Meanwhile, the generation of the model also must be taken into consideration. While generally generations one through three are compatible with each other, generation four is often an outlier. Thus, between generations and Glock models, a lot of complexity can be added to choosing the right barrel. Thankfully, we’ve pointed out in our reviews which Glock model each barrel is compatible with. We’ve also placed a high priority on universal compatibility. While not all of the barrels we’ve reviewed can be interchanged with any model of Glock, a few are. Thus, you should have no problem finding the perfect barrel for your Glock, regardless of model or generation but be sure you do pay attention to this! It can get more involved. For example, with a conversion barrel, it is possible to have more mix and match options. But as that’s outside of the scope of this article, we’re going to supply you with the best barrels on the market and point out compatibility “out of the box” so you don’t encounter any problems. ​It’s not advisable to shoot lead bullets with the stock barrel, as it utilizes polygonal rifling and can cause hazardous buildup. An aftermarket barrel can eliminate this problem and it’s one of the top reasons to purchase one. ​The Glock’s stock barrel isn’t bad quality, but many aftermarket barrels introduce great materials and finishes that help to keep the barrel in top shape for a very long time, making them worthy of the investment. ​It’s certainly possible to find an expensive Glock barrel, but many are actually quite affordable. Considering the barrel is one of the most important parts of your gun, it might be worth considering applying your funds to an improved barrel. ​If only all upgrades were so easy! Once you know what to do, replacing the barrel can be done in as much time as it takes to walk to the fridge for a beer. But don’t worry, we’ll show you just how to do it. While barrels don’t have to be expensive, it’s advisable to generally avoid barrels that are very cheap. These are often made from materials inferior to even the stock barrel. A poor manufacturing process can also introduce inconsistent accuracy or feeding problems. As the whole point is to upgrade your current setup, it’s definitely worth doing your homework by reading our guide to find budget solutions that actually take you multiple steps forward rather than backward. Use the below reviews of the best aftermarket Glock barrels to find the best barrel for your needs. Remember to consider what aspects are most important to you, as each is unique, but so are you. We'll analyze each aftermarket barrel for everything from specifics like weight, to value, but you know your needs best. If you need or want a new barrel for your Glock, you’ll quickly find that they can sometimes be a tad pricey. Thankfully, brands like Silencerco exist to provide more affordable solutions. But how well does Silencerco hold up? A lack of reviews for this brand on the internet makes their barrels a gamble, but thankfully, we’re here to let you know that their barrels perform just fine. The most important aspect to consider with a new barrel is how well the accuracy holds up, and Silencerco barrels perform very similarly to stock barrels, and in fact, are even a bit tighter. With or without a suppressor you will not have a noticeable point of impact change and likely see good improvement. One concern is that the barrel can heat up quickly when consistently firing for an extended period and this will start to change the point of impact. Of course, this is not unique to a Silenceco barrel, per se, but it is more evident here. This shouldn’t be a problem in practice unless you’re speed-shooting targets. It’s available for Gen 3 and Gen 4 Glocks and will be a little different depending on which you choose, but all are consistently good quality. Construction is excellent, with a thread protector, well-cut threads, and a silky-smooth feed ramp. It is made with 416R stainless steel and you can get it in either a black nitride finish or a natural stainless-steel finish. Overall, given its improved accuracy, excellent construction, and available options, we find it to be a very good barrel. Add in the value of its affordability, and it’s our pick for the top Glock barrel on the market. A durable barrel that’s not too hard on the wallet, Silencerco Threaded Barrels enhance the Glock experience over stock barrels, allowing everyone to have a better experience. A Great Sign of Partnerships to Come from Brownells! Victory First barrels from Brownells offer everything you might expect from a partnership between the two brands. While it’s only available for G17 and G19 Gen 5 pistols, owners of these respective firearms should be quite happy. 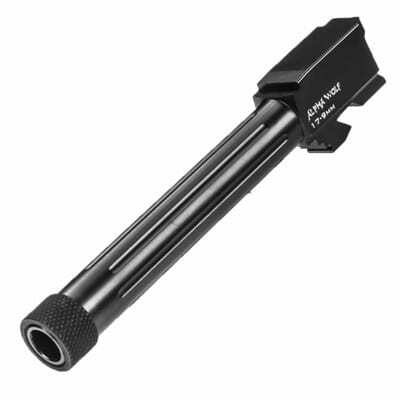 Chambered in 9mm, machined from 416R stainless-steel, and finished off with black nitride, and just all-around sturdy in construction, the barrel is durable and should last a long time. They are available with threaded muzzles which helps facilitate the use of suppressors, featuring an 11-degree cut target crown to enhance accuracy. So, how does it perform with these enhancements? We’re happy to say that Victory First barrels improve consistent accuracy over Glock OEM barrels to the point we consider it to be the best marksman barrel. It fires very tightly and you’ll be able to feed it just about any type of ammunition and experience no jams, making it perfect for all occasions. Victory First claims to have spent over a year testing and tweaking their barrel for maximum quality, and it really does show. We love that Brownells often offers great budget solutions for gun owners and this collaboration with Victory First shows that they’re committed to quality, too. There’s no word on how long this edition of the barrel will be available, however, so we’d advise jumping on this great deal while you can. Brownells and Victory First have partnered to create an excellent barrel for a surprisingly great price. G17 and G19 Gen 5 owners will definitely want to check it out, although it might not be available forever. 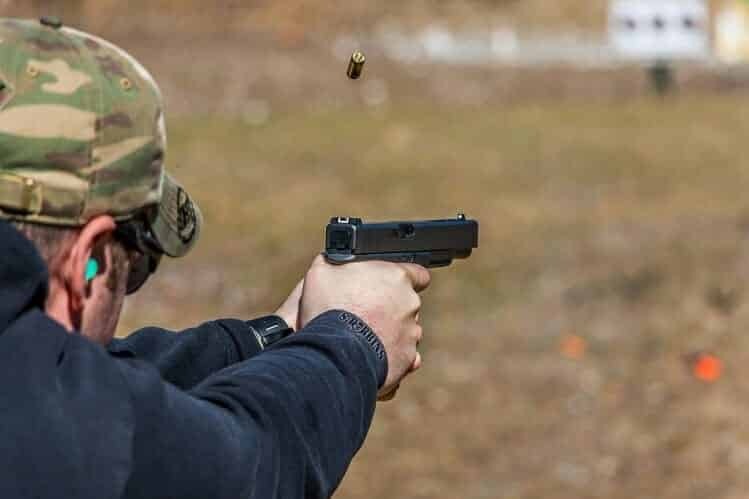 In developing their Glock barrels, Wilson Combat consulted Larry Vickers, a retired Master Sergeant, as well as ex-Special Force Operational Detachment-Delta. He’s a routine contributor to Wilson and those passionate about pistols will recognize his name, as he’s been a huge advocate for pistol smithing for a very long time. This relationship tends to pay dividends for Wilson Combat. For starters, the barrel drops right on in without material removal, simply and easily with no fuss. You’ll immediately recognize the quality of the 416R machined stainless-steel, which has some heft to it and feels smooth as silk. Oversized at contact points, it’s an exceptionally secure fit. Heat-treated to R/C 40 with a polished ramp, bore, and supported chamber, this is a barrel that’s eager to fire. It’s not picky, either, as 1 in 16” twist conventional broach rifling allows for jacketed, plated, or lead bullets without pressure spikes. As for accuracy, it offers a considerable improvement in the tightness of your shots compared to an OEM barrel. Additionally, it performs smoothly and you shouldn’t experience malfunctions or failures, even in fast shooting for extended periods. This is where the heat-treated and hefty steel really shines. Overall, there’s a lot to love and we also appreciate that it works universally with all Glock models, so everyone can enjoy the benefit. 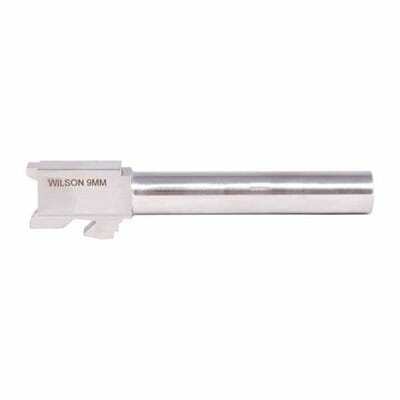 Glock owners who demand excellent performance and durability from their barrels will be very pleased with the thoughtful design choices and rugged construction of Wilson Combat’s universal barrels for Glock. Only Available for the Glock 43. Blacklist Industries is known for producing excellent match barrels and these Glock barrels are among the most precise on our list. Machined from 416R stainless-steel, you’ll enjoy excellent durability. Eight individual column flutes are joined at safe depths to provide a unique appearance and finish. Accuracy, as we’ve stated, is excellent and much improved over OEM barrels. This is thanks in large part to Blacklist’s advanced broach rifling process. Blacklist Industries is also well-known for an intense quality inspection process, which means each and every barrel is going to provide superior accuracy. A recessed crown further enhances both short-term, as well as long term, accuracy. A recession is good for keeping the edge of the rifling safe from damage which may affect bullet dynamics. This is a good design choice, though it should be kept in mind that the greatest and most accurate barrels can degrade. You want to look for designs such as this that ensure consistent accuracy for the long run. Additionally, the match chamber works with any bullet material as well as +P ammunition. This provides a reduced risk of pressure spikes. 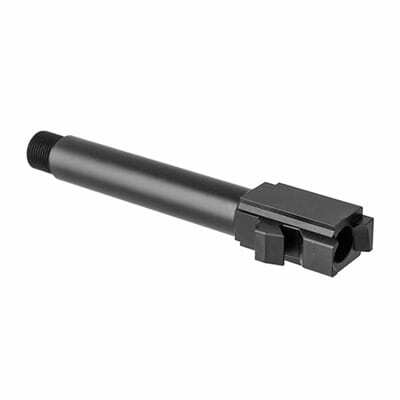 If you’re looking for a very well-made match barrel for the Glock 43, look no further. The only downside is that it’s only available for the Glock 43, although it is compatible with all generations, from 1-4. Owners of a Glock 43 who would prefer a match barrel will be very happy with the super-accurate and long-lasting Blacklist Industries Drop-In Ultra Match Barrel, though owners of other models will need to look elsewhere. Lone Wolf produces excellent barrels and the Alphawolf Threaded Barrels for Glock are no exception to their high standards. 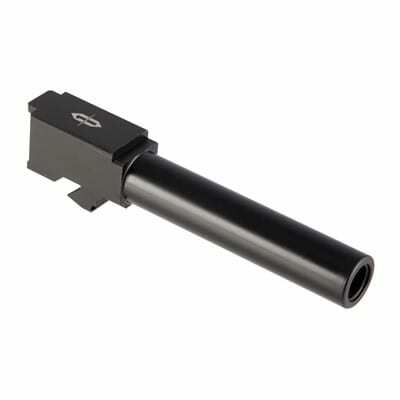 For those who are looking to improve their barrel while maintaining support for a suppressor, Lone Wolf has your back. Machined from stainless steel and heat treated to RC 40-42, and finally finished off with salt bath nitrite, it’s a durable barrel that’s ready to perform with exceptional smoothness. You’ll enjoy an easy drop-in installation to get you going. The Alphawolf is prominently rated with jacket ammunition, cast lead, and plated ammunition. You’ll have no concerns shooting targets, sporting cartridges, and enjoying consistent performance with self-defense or combat loads. Eight fluting cuts reduce the weight of the barrel and make for an attractive design. This also better disperses heat, improving performance. In shooting tests without a silencer, the Alphawolf shows marked improvement in accuracy. It’s worth remembering that the primary point of the Alphawolf is to allow for a suppressor, so improved accuracy is really quite a bonus. With a suppressor, the Alphawolf performs in its element and provides about the best accuracy you can get with this configuration. The only downside is that testing has demonstrated excellent performance with all but higher grain rounds. Once you’re over 200 grain or so, you’ll notice the occasional failure to feed. Otherwise, it performs virtually malfunction-free. Those who love shooting with a suppressor will want to check out the Lone Wolf Alphawolf Threaded Barrels for Glock, an exceptionally durable and accurate product for any occasion. Installing a new barrel on your Glock is thankfully very easy, and anyone can do it. It requires no tools and can be done once you’ve learned how in just a few minutes. For this reason, replacing the barrel might not be the first thing a new gun owner thinks to do, but it’s a great first exercise to get accustomed to gun components and installations. However, you have to start somewhere, so we’re going to assume this is your first time taking apart a gun. It might look like a lot of steps, but it’s really not—you’ve got this! As always, be sure the gun is unloaded. Safety first! Grab the takedown indents with your index finger and thumb and pull back, allowing you to remove the slide. Remove the recoil spring and guide rod. There’s no trick to it, they should just come right out. Take out your unwanted barrel. Take the opportunity to clean any parts, both in your gun and on the old barrel if you’d like to reuse it later. Grab your new barrel. Remove the cap, or thread protector, if it has one. Drop it in and be sure it’s in place. If it had a cap, screw it back on. Replace the spring. It should lock into place in the bottom notch. Slide the lower receiver back on. While replacing the stock barrel on a Glock isn’t an absolute necessity, it’s definitely worth investing in for improved performance and accuracy, especially for sport shooters. However, everyone can enjoy the improvements and it’s worth considering over many other components if it fits in your budget. We’ve shown you how to find a barrel, rounded up the best Glock barrels, and demonstrated how to do the installation. Remember that compatibility is important when choosing a barrel. Be sure to carefully follow our guide for all parts of your journey to ensure compatibility and safety, and enjoy your new barrel!